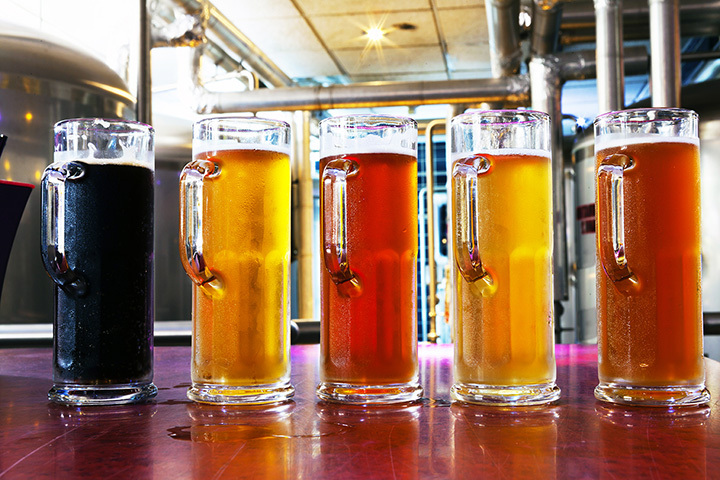 The 10 Best Breweries in Arizona! The last decade has been something of a craft beer renaissance. In fact, the number of craft breweries in the U.S. rose to over 5,000 last year, according to information from Brewers Association. But while cities like Portland and Denver get all the buzz, Arizona is oft overlooked. Here in Arizona, there are plenty of local breweries with their own special blend of beers worthy of a sample. Here are the 10 best breweries in Arizona. Four Peaks is the signature Arizona brewery. Since opening their 8th street location in 1996, Four Peaks has grown to a nationally recognized brewery thanks in large part to their flagship beer—The Kilt Lifter. This Scottish style ale has a malty sweetness to go with its roasted barley flavor. It’s so good, in fact, that its won numerous awards including the World Beer Cup Gold Award last year. Additionally, mainstays like the 8th Street Pale Ale, Peach Ale, and Hop Knot IPA have helped put Four Peaks in the national spotlight. Located just a half mile from the Arizona State University campus, Four Peaks has the appeal of a friendly neighborhood bar that just happens to brew award-winning beer. SanTan Brewing Company has become one of Arizona’s best craft breweries in less than 10 years. SanTan’s Southwestern ales are so beloved that they have gained fans throughout the Southwest and California. Their core beers include the Devil’s Ale, HopShock IPA, and HefeWeizen that are best enjoyed on a warm, sunny day. Perhaps their most refreshing beer is Mr. Pineapple—a pineapple wheat beer that won a silver award at the World Beer Cup and was named the Best Local Beer in Phoenix by The Phoenix New Times. Formally known as Outrageous Homebrewer’s Social Outpost, O.H.S.O is as much about their atmosphere as they are the beer. Their dog-friendly patio is lined with bicycles and lively patrons enjoying their mix of brews and bites. Still, their locally brewed beers hold their own against the competition. They have their own pilsner, IPA, porter, and blonde ale have quite the range in both bitterness and alcohol percentage. The real treat is the Handlebar Hefe. It’s a Bavarian wheat beer that’s a true summer treat. Sometimes the best way to warm up on a cold night is by drinking beer. If that’s your style, head to Lumberyard Brewing Company. Their Flagstaff IPA is sure to warm you up on even the most frigid of nights. This heavy bodied ale has a blend of hops and a 90 on the International Bitterness Units scale. Lumberyard also has crowd pleasers like the Knotty Pine Pale Ale and Red Ale. This microbrewery is owned and operated by the same team as Beaver Street Brewery. While they sell many of the same beers, Lumberyard has the superior location. It’s located in a restored building from Flagstaff’s lumber era and has a spacious patio. Choice is king at Mother Bunch Brewing. This downtown Phoenix microbrewery has a rotating list of over 20 tap beers. Their unique craft beers include the tasty Oatmeal Chocolate Milk Stout, malty Roosevelt Red, and the apple Saison Pomme. Most of their beers are original but they also include a tap rotation of the owner’s favorite beers from other local breweries. You can also try beers in different sizes ranging from a four-ounce sampler up to a 64-ounce growler. Mother Bunch arrived on the local scene in 2014 and has already helped put Phoenix on the craft beer map. Tucson’s Barrio Brewing has been making beer lovers salivate since 1991. That’s when they opened their brewing company located inside the Tucson staple Gentle Ben’s. They’ve since relocated but have continued to brew their signature house beers including the Barrio Blonde, Copperhead Pale Ale, and Taylor Jane’s Raspberry Ale. Their tap list also includes seasonal specials and inventive creations like the espresso infused Mocha Java Stout. Barrio may be the longest-operating brewery in Arizona, but with their diverse house beers and famous happy hour they’ve shown no signs of slowing down. Beer and board games are what you’ll find at Mother Road Brewing Company. This Flagstaff establishment is armed with a knowledgeable staff of beer lovers and a laidback vibe. Beer enthusiasts will enjoy their rotating list of tap beers and their signature brews like the Lost Highway Black IPA, Roadside American Ale, and Gold Road Kolsch Style Ale. When push comes to shove, this brewery is all about the Tower Station IPA. This copper-orange IPA has a balance of Pilsner and pale malts and flavors of grapefruit peel and pine. No two trips to Dragoon Brewing Company are the same. That’s because they only brew two beers year-round: Dragoon IPA and Stronghold Session Ale. However, throughout the year Dragoon brews seasonal crafts made with regional ingredients and some specialty beers that are brewed annually. Their beers are best enjoyed in their taproom for an onsite tasting. While they don’t sell food, Dragoon usually has a food truck parked outside to help you wash down your beers. Huss Brewing Company is a lager and ale brewery run by a husband and wife duo. While their taproom might not be the biggest, they do offer 24 rotating beers of everything from porters to lagers. Huss has risen to prominence by brewing the local favorite Scottsdale Blonde. It’s a German Style Kolsch brewed similar to a lager that’s become Huss’s signature beer. In addition to their taproom, you can work off your beer belly at Downward Drafts—Arizona’s first yoga in a brewery. McFate Brewing Company has come a long way since opening in 2012. They’ve since brewed over 300 small-batch beers and even opened a second South Scottsdale location. They have a rotating tap list of about 20 tasty beers. Their list includes a strong mix of Pale Ales, Porters, and IPA’s. McFate has also gotten in on awards seasons. Their seasonal Candy Bar Milk Stout won a silver medal at the Great American Beer Festival in 2013. View more Arizona Breweries and Brew Pubs.